Almost a year ago, three island residents joined forces along with the San Pedro Lions Club and created the island’s first ever Food Bank. The program was initiated with the sole purpose to assist low income families that cannot always feed their children. They are provided with groceries once a week at the Lions Den. Families that benefit from the program need to meet a specific criteria before they can be part of the Food Bank. Such criteria has raised concerns since some feel that those most in need might actually be left out of the feeding program. Speaking to The San Pedro Sun, Britney O’Daniel, one of the founders of the Food Bank gave details on what the criteria is all about. “First of all they need to come and apply; we have applications at the Lions Den where the Food Bank is located. At least one member of the family must have some sort of employment, have children under the age of 18 that live at home with them and there is also the exception when sometimes there are elderly family members living in the household who are not able to be employed,” said O’Daniel. The fact that someone needs to be working in the family, raised the question about single mothers who have no jobs and are with children to feed. According to O’Daniel the program was not meant to support a family for all the time, but to just assist them. Many people with a lot of children may only work a few days of the week or make a minimum salary which may not be enough to sustain everyone in the household. This is where the Food Bank helps families to meet their ends, especially in feeding their children. However, O’Daniel disregarded the comments about anyone being turned down during the weekly food distribution. “We’ve had some people, single mothers in particular that are not working and have children to maintain. We don’t turn them down, we have actually put them up in the program, however it comes with conditions. We assist them but they have a window period of thirty to sixty days to find a job so they can meet the criteria. If by this time the individual has not been able to meet the criteria then, the person is pulled out of the program. But so far that has not been necessary as family members have been able to find a job within that period of time, so they continue in the program,” stated O’Daniel. Currently the Food Bank assists 35 families which amount to around 200 persons every week. Many of the families have six to seven children in their households. 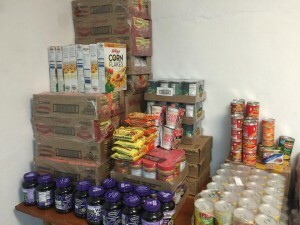 She added that at any time, there is always a long list of families waiting to be approved in the Food Bank. O’Daniel estimates around $1,500 is needed every week in order to assist all the families that are dependent of the Food Bank. At times, there is not enough for everyone and a few people are left out. “Sometimes we need to put people off the list and put others that need it the most, and as much as we would like to help everyone at the moment, we just cannot do it. It’s only three of us supporting the program, we get no assistance from other sources and so we work with what we have. This is the main reason why we have criteria because we don’t have enough resources to assist everybody. If anyone out there would be willing to donate to the program we would be happy to welcome any help to the Food Bank so we can help feed more people,” indicated O’Daniel. The Food Bank was recently the recipient of a Catamaran and they plan to start a charitable cruise next month, which will then take place once a month. The cruise will be a full day trip to Caye Caulker and will have a cost of $75US which will include meals and drinks. All proceeds from the sailing trip will go directly to the Food Bank. Dates for the first charitable cruise will be announced soon. Everyone is encouraged to support such a worthy cause. Anyone wanting to contribute to the Food Bank can drop off nonperishable or canned goods to the San Pedro Lions Den on Fridays from 8AM to 6PM. For pick-ups, contact 630-1241/632-5017/628-8461. Monetary donations are accepted but not encouraged; goods are preferred.